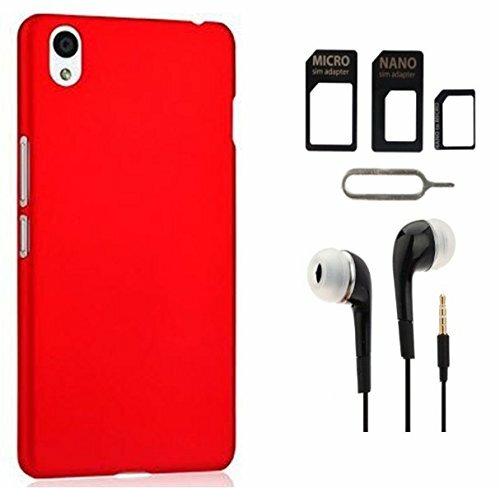 Tidel Red Matte Finish Rubbrised Slim Hard Back Cover For OnePlus X With 3.5mm Handsfree Earphone & MICRO/NANO SIM ADAPTER@279 Rs [Mrp:-1047] - Onlinedeals.discount - A leading product discovery website. Find the true prices of products, read reviews and buy top brand products at reasonable prices. Tidel Ultra Thin and Stylish Rubberized Plastic Back Cover Weights Less than 10 -15 Gram. Now Protect Your Phone from Scratches and Dents with this Back Coverdust Free, Washable, Fingerprints Free. Its a Matte Finish and Have Smooth Feeling in Hands. Made from High Quality Polycarbonate and Rubber Material Easy to Install and Remove from Your Mobile with Hands. Flexible and Durable all Buttons and Jacks are Accessible Through the Cutouts Hard But Flexible Material Makes Fitting and Removing the Case Much Easier High Quality and Nicely Made For Maximum Durability and Protection. It comes with 3.5mm Stereo Earphones With Mic which is supported by wide range of devices and have super sound quality. Package Includes A micro nano sim adapter.Not :- earphone send only available color in stock.